Algae Energy - the past and the future - Algae: CO2 sequestering organisms revolutionizing biotechnology through nutrition, aquaculture, pharmaceuticals, bioremediation, biopolymers and biofuels. Algae: CO2 sequestering organisms revolutionizing biotechnology through nutrition, aquaculture, pharmaceuticals, bioremediation, biopolymers and biofuels. Algal biofuel production offers great potential as a sustainable source of bioenergy without competing for arable land with food crops. However, many challenges must be overcome to enable this to be done commercially at the scale required to produce biofuels. Here we explain how an understanding of algal ecology could lead to more reliable raceway-based microalgal cultivation, drawing from established principles of community ecology to highlight practices that could be applied to protect algal cultures from unwanted contaminants. Using theoretical concepts, scientists try to show how an understanding of local community dynamics at the species level might be used to enhance productivity by encouraging certain community structures over others. Left figure: Freshwater trophic cascade. A diagrammatic representation of a typical trophic cascade established in freshwater systems. Two alternate states are possible, where the major primary producers are either phytoplankton or macrophytes: these two groups are thus in competition with each other (represented by the dashed arrow). The phytoplankton are grazed most efficiently by large zooplankton, which are in direct competition with smaller zooplankton (dashed arrow). The zooplankton are eaten by zooplanktivorous fish, which can be in turn consumed by piscivorous fish predators. The concept of top-down “biomanipulation” is represented by the block arrows. Piscivorous fish are either introduced or encouraged if present in the freshwater environment. An increase in piscivores leads to a decline in zooplanktivorous fish, and eventually phytoplankton. The competitive balance tips in favour of macrophytes, which then predominate. Biomanipulation can be attempted at earlier stages in the foodchain, for example by encouraging the growth of large zooplankton, or the removal of zooplanktivorous fish. Source: Kazamia, E., Aldridge, D. C., & Smith, A. G. (2012). Synthetic ecology – A way forward for sustainable algal biofuel production? Journal of Biotechnology, 162(1), 163–169. doi:10.1016/j.jbiotec.2012.03.022. Nitrogen is one of the primary nutrients critical for the survival of all living organisms. It is a necessary component of many biomolecules, including proteins, DNA, and chlorophyll. Although nitrogen is very abundant in the atmosphere as dinitrogen gas (N2), it is largely inaccessible in this form to most organisms, making nitrogen a scarce resource and often limiting primary productivity in many ecosystems. Only when nitrogen is converted from dinitrogen gas into ammonia (NH3) does it become available to primary producers, such as plants. In addition to N2 and NH3, nitrogen exists in many different forms, including both inorganic (e.g., ammonia, nitrate) and organic (e.g., amino and nucleic acids) forms. Thus, nitrogen undergoes many different transformations in the ecosystem, changing from one form to another as organisms use it for growth and, in some cases, energy. 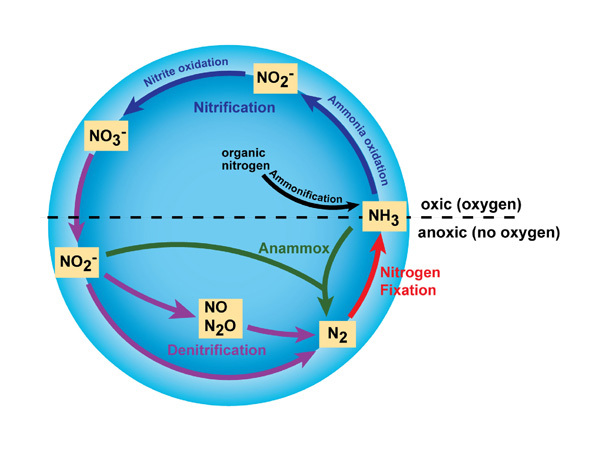 The major transformations of nitrogen are nitrogen fixation, nitrification, denitrification, anammox, and ammonification (Figure 1). The transformation of nitrogen into its many oxidation states is key to productivity in the biosphere and is highly dependent on the activities of a diverse assemblage of microorganisms, such as bacteria, archaea, and fungi. Since the mid-1900s, humans have been exerting an ever-increasing impact on the global nitrogen cycle. Human activities, such as making fertilizers and burning fossil fuels, have significantly altered the amount of fixed nitrogen in the Earth's ecosystems. In fact, some predict that by 2030, the amount of nitrogen fixed by human activities will exceed that fixed by microbial processes (Vitousek 1997). Increases in available nitrogen can alter ecosystems by increasing primary productivity and impacting carbon storage (Galloway et al. 1994). Because of the importance of nitrogen in all ecosystems and the significant impact from human activities, nitrogen and its transformations have received a great deal of attention from ecologists. Ammonification:﻿ When an organism excretes waste or dies, the nitrogen in its tissues is in the form of organic nitrogen (e.g. amino acids, DNA). Various fungi and prokaryotes then decompose the tissue and release inorganic nitrogen back into the ecosystem as ammonia in the process known as ammonification. The ammonia then becomes available for uptake by plants and other microorganisms for growth. ﻿ Nitrogen Fixation:﻿ Nitrogen gas (N2) makes up nearly 80% of the Earth's atmosphere, yet nitrogen is often the nutrient that limits primary production in many ecosystems. Why is this so? Because plants and animals are not able to use nitrogen gas in that form. For nitrogen to be available to make proteins, DNA, and other biologically important compounds, it must first be converted into a different chemical form. The process of converting N2 into biologically available nitrogen is called nitrogen fixation. N2 gas is a very stable compound due to the strength of the triple bond between the nitrogen atoms, and it requires a large amount of energy to break this bond. The whole process requires eight electrons and at least sixteen ATP molecules (Figure 2). As a result, only a select group of prokaryotes are able to carry out this energetically demanding process. Although most nitrogen fixation is carried out by prokaryotes, some nitrogen can be fixed abiotically by lightning or certain industrial processes, including the combustion of fossil fuels. Some nitrogen-fixing organisms are free-living while others are symbiotic nitrogen-fixers, which require a close association with a host to carry out the process. Most of the symbiotic associations are very specific and have complex mechanisms that help to maintain the symbiosis. For example, root exudates from legume plants (e.g., peas, clover, soybeans) serve as a signal to certain species of Rhizobium, which are nitrogen-fixing bacteria. This signal attracts the bacteria to the roots, and a very complex series of events then occurs to initiate uptake of the bacteria into the root and trigger the process of nitrogen fixation in nodules that form on the roots (Figure 3). ﻿Although there is great physiological and phylogenetic diversity among the organisms that carry out nitrogen fixation, they all have a similar enzyme complex called nitrogenase that catalyzes the reduction of N2 to NH3 (ammonia), which can be used as a genetic marker to identify the potential for nitrogen fixation. One of the characteristics of nitrogenase is that the enzyme complex is very sensitive to oxygen and is deactivated in its presence. This presents an interesting dilemma for aerobic nitrogen-fixers and particularly for aerobic nitrogen-fixers that are also photosynthetic since they actually produce oxygen. Nitrification: is the process that converts ammonia to nitrite and then to nitrate and is another important step in the global nitrogen cycle. Most nitrification occurs aerobically and is carried out exclusively by prokaryotes. 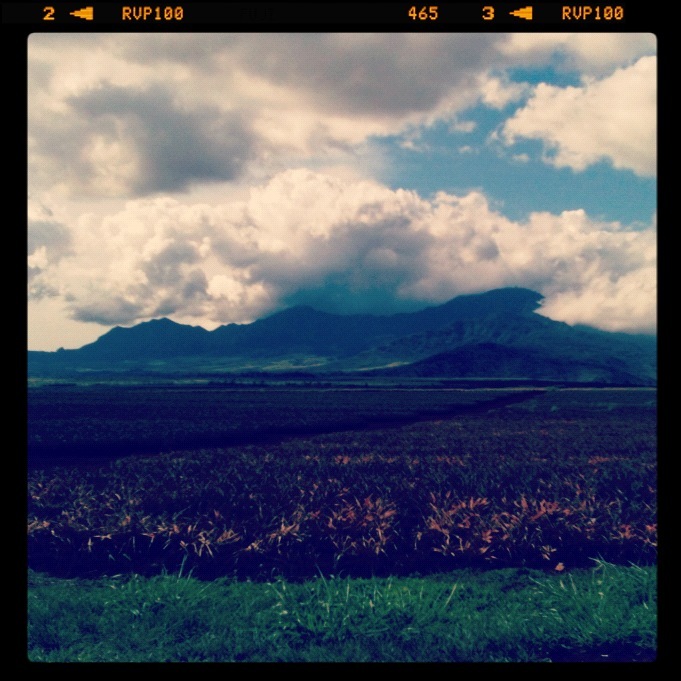 There are two distinct steps of nitrification that are carried out by distinct types of micro-organisms. The first step is the oxidation of ammonia to nitrite, which is carried out by microbes known as ammonia-oxidizers. Aerobic ammonia oxidizers convert ammonia to nitrite via the intermediate hydroxylamine, a process that requires two different enzymes, ammonia monooxygenase and hydroxylamine oxidoreductase (Figure 4). The process generates a very small amount of energy relative to many other types of metabolism; as a result, nitrosofiers are notoriously very slow growers. Additionally, aerobic ammonia oxidizers are also autotrophs, fixing carbon dioxide to produce organic carbon, much like photosynthetic organisms, but using ammonia as the energy source instead of light. ﻿Unlike nitrogen fixation that is carried out by many different kinds of microbes, ammonia oxidation is less broadly distributed among prokaryotes. Until recently, it was thought that all ammonia oxidation was carried out by only a few types of bacteria in the genera Nitrosomonas, Nitrosospira, and Nitrosococcus. However, in 2005 an archaeon was discovered that could also oxidize ammonia (Koenneke et al. 2005). Since their discovery, ammonia-oxidizing Archaea have often been found to outnumber the ammonia-oxidizing Bacteria in many habitats. In the past several years, ammonia-oxidizing Archaea have been found to be abundant in oceans, soils, and salt marshes, suggesting an important role in the nitrogen cycle for these newly-discovered organisms. Currently, only one ammonia-oxidizing archaeon has been grown in pure culture, Nitrosopumilus maritimus, so our understanding of their physiological diversity is limited. The second step in nitrification is the oxidation of nitrite (NO2-) to nitrate (NO3-) (Figure 5). This step is carried out by a completely separate group of prokaryotes, known as nitrite-oxidizing Bacteria. Some of the genera involved in nitrite oxidation include Nitrospira, Nitrobacter, Nitrococcus, and Nitrospina. Similar to ammonia oxidizers, the energy generated from the oxidation of nitrite to nitrate is very small, and thus growth yields are very low. In fact, ammonia- and nitrite-oxidizers must oxidize many molecules of ammonia or nitrite in order to fix a single molecule of CO2. For complete nitrification, both ammonia oxidation and nitrite oxidation must occur. ﻿Ammonia-oxidizers and nitrite-oxidizers are ubiquitous in aerobic environments. They have been extensively studied in natural environments such as soils, estuaries, lakes, and open-ocean environments. However, ﻿ammonia- and nitrite-oxidizers also play a very important role in wastewater treatment facilities by removing potentially harmful levels of ammonium that could lead to the pollution of the receiving waters.﻿ Much research has focused on how to maintain stable populations of these important microbes in wastewater treatment plants. Additionally, ammonia- and nitrite-oxidizers help to maintain healthy aquaria by facilitating the removal of potentially toxic ammonium excreted in fish urine. ﻿Anammox﻿: Traditionally, all nitrification was thought to be carried out under aerobic conditions, but recently a new type of ammonia oxidation occurring under anoxic conditions was discovered (Strous et al. 1999). Anammox (anaerobic ammonia oxidation) is carried out by prokaryotes belonging to the Planctomycetes phylum of Bacteria. The first described anammox bacterium was Brocadia anammoxidans. Anammox bacteria oxidize ammonia by using nitrite as the electron acceptor to produce gaseous nitrogen (Figure 6). Anammox bacteria were first discovered in anoxic bioreactors of wasterwater treatment plants but have since been found in a variety of aquatic systems, including low-oxygen zones of the ocean, coastal and estuarine sediments, mangroves, and freshwater lakes. In some areas of the ocean, the anammox process is considered to be responsible for a significant loss of nitrogen (Kuypers et al. 2005). However, Ward et al. (2009) argue that denitrification rather than anammox is responsible for most nitrogen loss in other areas. Whether anammox or denitrification is responsible for most nitrogen loss in the ocean, it is clear that anammox represents an important process in the global nitrogen cycle. ﻿Denitrification:﻿ is the process that converts nitrate to nitrogen gas, thus removing bioavailable nitrogen and returning it to the atmosphere. Dinitrogen gas (N2) is the ultimate end product of denitrification, but other intermediate gaseous forms of nitrogen exist (Figure 7). Some of these gases, such as nitrous oxide (N2O), are considered greenhouse gasses, reacting with ozone and contributing to air pollution. Unlike nitrification, denitrification is an anaerobic process, occurring mostly in soils and sediments and anoxic zones in lakes and oceans. Similar to nitrogen fixation, denitrification is carried out by a diverse group of prokaryotes, and there is recent evidence that some eukaryotes are also capable of denitrification (Risgaard-Petersen et al. 2006). Some denitrifying bacteria include species in the genera Bacillus, Paracoccus, and Pseudomonas. Denitrifiers are chemoorganotrophs and thus must also be supplied with some form of organic carbon. Denitrification is important in that it removes fixed nitrogen (i.e., nitrate) from the ecosystem and returns it to the atmosphere in a biologically inert form (N2). ﻿This is particularly important in agriculture where the loss of nitrates in fertilizer is detrimental and costly. However, denitrification in wastewater treatment plays a very beneficial role by removing unwanted nitrates from the wastewater effluent, thereby reducing the chances that the water discharged from the treatment plants will cause undesirable consequences (e.g., algal blooms)﻿. Ecological Implications of Human Alterations to the Nitrogen Cycle: Many human activities have a significant impact on the nitrogen cycle. Burning fossil fuels, application of nitrogen-based fertilizers, and other activities can dramatically increase the amount of biologically available nitrogen in an ecosystem. And because nitrogen availability often limits the primary productivity of many ecosystems, large changes in the availability of nitrogen can lead to severe alterations of the nitrogen cycle in both aquatic and terrestrial ecosystems. Industrial nitrogen fixation has increased exponentially since the 1940s, and human activity has doubled the amount of global nitrogen fixation (Vitousek et al. 1997). In terrestrial ecosystems, the addition of nitrogen can lead to nutrient imbalance in trees, changes in forest health, and declines in biodiversity. With increased nitrogen availability there is often a change in carbon storage, thus impacting more processes than just the nitrogen cycle. In agricultural systems, fertilizers are used extensively to increase plant production, but unused nitrogen, usually in the form of nitrate, can leach out of the soil, enter streams and rivers, and ultimately make its way into our drinking water. The process of making synthetic fertilizers for use in agriculture by causing N2 to react with H2, known as the Haber-Bosch process, has increased significantly over the past several decades. In fact, today, nearly 80% of the nitrogen found in human tissues originated from the Haber-Bosch process (Howarth 2008). Much of the nitrogen applied to agricultural and urban areas ultimately enters rivers and nearshore coastal systems. In nearshore marine systems, increases in nitrogen can often lead to anoxia (no oxygen) or hypoxia (low oxygen), altered biodiversity, changes in food-web structure, and general habitat degradation. One common consequence of increased nitrogen is an increase in harmful algal blooms (Howarth 2008). Toxic blooms of certain types of dinoflagellates have been associated with high fish and shellfish mortality in some areas. Even without such economically catastrophic effects, the addition of nitrogen can lead to changes in biodiversity and species composition that may lead to changes in overall ecosystem function. Some have even suggested that alterations to the nitrogen cycle may lead to an increased risk of parasitic and infectious diseases among humans and wildlife (Johnson et al. 2010). Additionally, increases in nitrogen in aquatic systems can lead to increased acidification in freshwater ecosystems. Summary: Nitrogen is arguably the most important nutrient in regulating primary productivity﻿ and species diversity in both aquatic and terrestrial ecosystems ﻿(Vitousek et al. 2002). Microbially-driven processes such as nitrogen fixation, nitrification, and denitrification, constitute the bulk of nitrogen transformations, and play a critical role in the fate of nitrogen in the Earth's ecosystems. However, as human populations continue to increase, the consequences of human activities continue to threaten our resources and have already significantly altered the global nitrogen cycle. Galloway, J. N. et al. Year 2020: Consequences of population growth and development on deposition of oxidized nitrogen. Ambio 23, 120–123 (1994). Howarth, R. W. Coastal nitrogen pollution: a review of sources and trends globally and regionally. Harmful Algae 8, 14–20. (2008). Johnson, P. T. J. et al. Linking environmental nutrient enrichment and disease emergence in humans and wildlife. Ecological Applications 20, 16–29 (2010). Koenneke, M. et al. Isolation of an autotrophic ammonia-oxidizing marine archaeon. Nature 437, 543–546 (2005). Kuypers, M. M. M. et al. Massive nitrogen loss from the Benguela upwelling system through anaerobic ammonium oxidation. Proceedings of the National Academy of Sciences of the United States of America 102, 6478–6483 (2005). Risgaard-Petersen, N. et al. Evidence for complete denitrification in a benthic foraminifer. Nature 443, 93–96 (2006). Strous, M. et al. Missing lithotroph identified as new planctomycete. Nature 400, 446–449 (1999). Vitousek, P. M. et al. Human alteration of the global nitrogen cycle: sources and consequences. Ecological Applications 7, 737–750 (1997). Vitousek, P. M. et al. Towards an ecological understanding of biological nitrogen fixation. Biogeochemistry 57, 1–45 (2002). Ward, B. B. et al. Denitrification as the dominant nitrogen loss process in the Arabian Sea. Nature 460, 78–81 (2009). Zehr, J. P. et al. Nitrogenase gene diversity and microbial community structure: a cross-system comparison. Environmental Microbiology 5, 539–554 (2003).